American Wayne (left) and Hamli proudly hold the book. Fatimah fields questions from reporters after the courtesy call. KUCHING: A book on how a group of rural youths and their equally young teachers united to build a school from scratch, ‘Three Rivers School – The Pioneering Years 1961-1971’ will be launched in Mukah on Aug 27. Head of State Tun Pehin Sri Abdul Taib Mahmud has been invited to launch the book by members of SMK Three Rivers Mukah Alumni Association who paid a courtesy call on him at the Astana yesterday. Advisor and patron of the alumni association, who is Minister of Welfare, Community Well Being, Women, Family and Childhood Development Datuk Fatimah Abdullah led the group. Alumni president Ahmad Lato, author Dr Hamli Biha, chief editor Dunstan Chan, editor Ahmad Rony Assim, former secretary of the committee Henry Joseph, treasurer Wilbert Kho, and former alumni committee member Robert Chiong were also present during the visit. 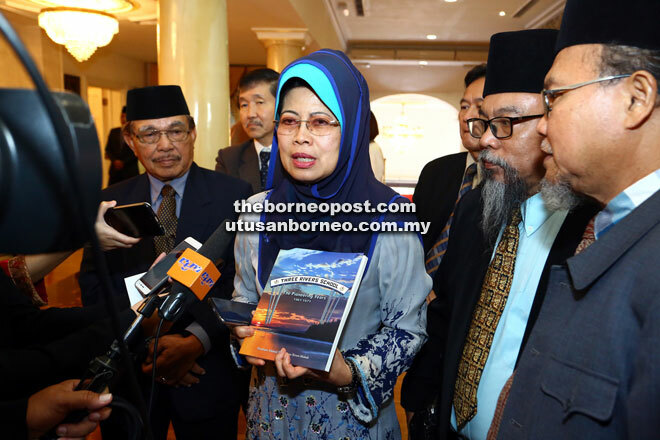 Telling reporters after leading the courtesy call, Fatimah said Three Rivers School played a pivotal role in the region defined by the Mukah, Oya and Balingian river basins. “This book took seven years to complete because of the long time to gather materials. Finally, after years of effort and hardwork by the production and publication committee, we are able to present the book to His Excellency and at the same time to invite him to the launching of the book on Aug 27 in Mukah,” she said. She added that the book. authored by Dr Hamli Biha, was the brainchild of His Excellency himself. The alumni felt that His Excellency is the most appropriate person to launch the book. 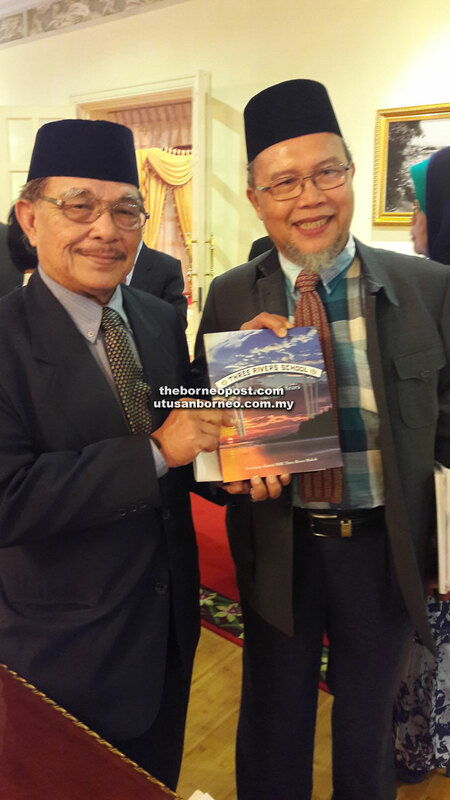 Many years ago, during His Excellency’s visit to Mukah in conjunction with the Kaul Festival when he was still the chief minister, he wanted the alumni association to come up with a book about Three Rivers School. His Excellency was of the opinion that the school was not only a pivotal academic institution for the people of three major river basins but it had also been playing an important role in producing leaders and intellectuals since its humble establishment by far-sighted local community leaders in 1961. The alumni took up the challenge and started the project during the tenure of the past committee. The production and publication committee sent the final edited copy to the printer in June this year. Immediate past president of the alumni and also chairman of the Three Rivers School book production and publication committee, Major ® American Wayne, who was also present during the visit yesterday said: “We hope this will be the first in a series as we continue to tell our stories up to the present day. Three Rivers School was established to serve the need of the communities of the Mukah, Oya and Balingian river basins. As it turned out, there were as many students from the Rejang Delta as well. When the school opened its first classes, the ground and buildings were not ready. The students were housed in make-shift classrooms at the Mukah Youth Club and the Chinese Chamber of Commerce building. The students worked with one mind to help to build the school physically. They were involved in the clearing of the land at the assigned site and helped to maintain the new school grounds. In those early years, more than half of the teaching staff were volunteers from various overseas aid programmes. Many of the local teachers were new diploma graduates. Despite that, the school produced excellent students and scored impressively in the public examination, culminating in a perfect score in 1965 with a 100 per cent pass. Many of the former students went on to achieve impressive success in the academic and professional fields. During those formative years, Three Rivers School also dominated the sports scene in the region. The school adopted the motto ‘Mind, Body and Spirit’.